The approved deal clears the way for private U.S. companies to sell arms. President Donald Trump has approved the sale of more lethal arms to Ukraine as the country fights off Russian-backed fighters in its east -- despite the president’s recent overtures for cooperation with Russian President Vladimir Putin. But while the latest sale is a new gift to the Ukrainian government, Trump still has not announced any decision on whether to provide a more powerful lethal-aid package that includes anti-tank and anti-aircraft missiles -- a proposal recommended by his National Security Council and awaiting his approval for months now. The newest sale consists of small arms and light weapons sold by American manufacturers to the Ukrainian military, not a direct sale or exchange from the U.S. government, according to the State Department. “The U.S. government is not selling the Ukrainian government these weapons. Under the previous two administrations, the U.S. government has approved export licenses to Ukraine, so this is nothing new,” State Department spokesperson Heather Nauert said in a statement to ABC News. The sale consists of sniper rifles, ammunition and other associated parts and materials, and is estimated to be worth $41.5 million, according to two U.S. congressional sources. But the “real get” for Ukraine would be the anti-tank and anti-aircraft weapons, as the congressional aide put it. (Pierre Crom/Getty Images, FILE) A Ukrainian serviceman walks on the frontline, Sept. 09, 2017 in Shyrokyne, Ukraine. The sea side resort on the Azov seashore has been reduced to rubble after two and half years of artillery fire between Russia-backed separatists and Ukrainian forces. That proposal has been sitting on Trump’s desk waiting for his approval for months, after it was recommended by his National Security Council, including Secretary of State Rex Tillerson and Defense Secretary James Mattis. It’s unclear when Trump intends to make a decision. “The United States has not provided lethal defensive equipment to Ukraine, nor have we ruled out doing so,” Nauert said in her statement -- a line several administration officials have had for months as the question continually arises. Such a sale would mark an escalation in American support for Ukraine as it battles Russian-backed and -led fighters in the country’s east. The conflict there has been frozen in terms of the battle lines for nearly four years, but the war is anything but cold. 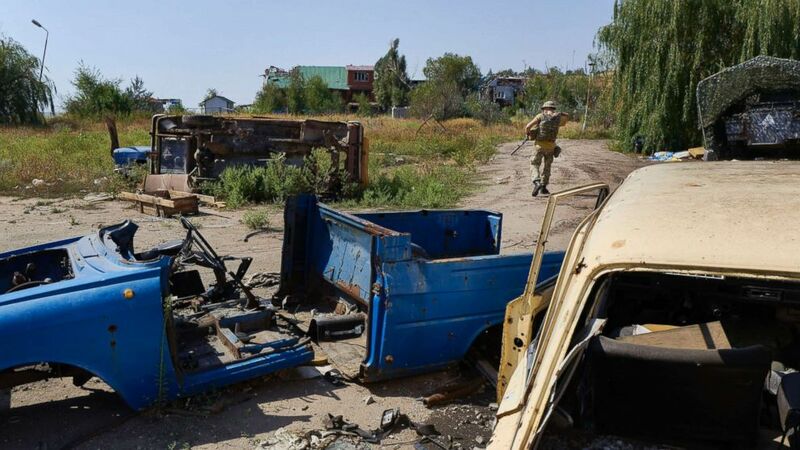 In the last few days, monitoring groups from the Organization for Security and Cooperation in Europe have recorded over 16,000 ceasefire violations, and as many as eight Ukrainian soldiers have been killed this week. The death toll stands at over 10,000 people since fighting began in 2014, according to a December report by the Office of the United Nations High Commissioner for Human Rights. (Lars Hagberg/AFP/Getty Images) Secretary of State Rex Tillerson speaks during a joint press conference with Canada's Minister of Foreign Affairs Chrystia Freeland (out of frame) on Parliament Hill in Ottawa, Ontario, Dec. 19, 2017. But while the U.S. searches for a peaceful solution to the violence, including by possibly providing these lethal defensive arms, Russia is calling that move, in particular, an act of destabilization and violence, and could possibly retaliate. Selling heavier arms directly to Ukraine could potentially damage relations between the two countries, some observers warn, even as Trump has called for more cooperation and spoken with Putin twice in the last week -- once to discuss the CIA’s intelligence sharing with Russia that thwarted a terror attack in St. Petersburg. “Both leaders agreed that this serves as an example of the positive things that can occur when our countries work together,” the White House said in a statement Sunday after the conversation. 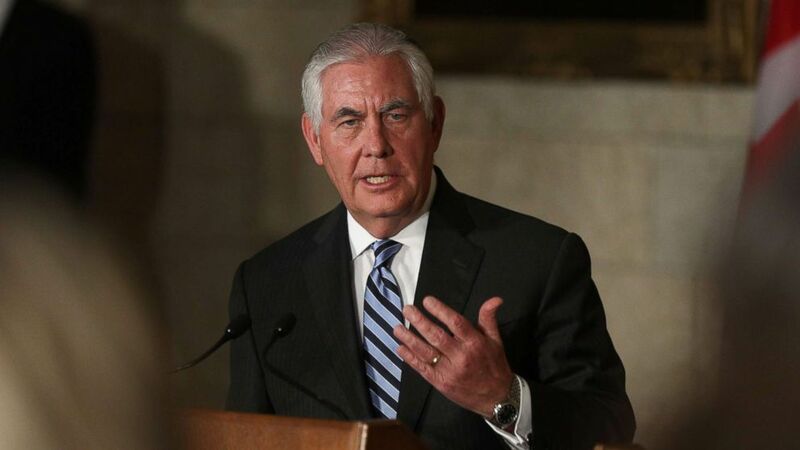 But the conflict in Ukraine stands in the way of greater cooperation, Tillerson has said repeatedly. “We must address Ukraine. It stands as the single most difficult obstacle to us renormalizing the relationship with Russia, which we badly would like to do,” he told reporters in Vienna on Dec. 7. While the new sale revealed Wednesday was short of the lethal defensive weapons expected, it still garnered praise from Congress’s most vocal Russia hawks. McCain has long called for such arms, vociferously criticizing the Obama administration for not doing so. The proposal was sent to Capitol Hill on Dec. 13, and members have 30 days to voice objections, otherwise the sale goes through and the State Department grants the licenses to the American manufacturers. It is expected to pass through congressional review without problem.